THIS IS ANOTHER EASY AND SEMI-COOL SALAD FOR THESE HOT SUMMER NIGHTS. Combine oil and spices in small mixing bowl. Coat chicken and grill 10-15 minutes. Meanwhile, combine beans in a microwave bowl with a few Tablespoons of water. Microwave 4-5 minutes just until heated through. Prepare avocado. 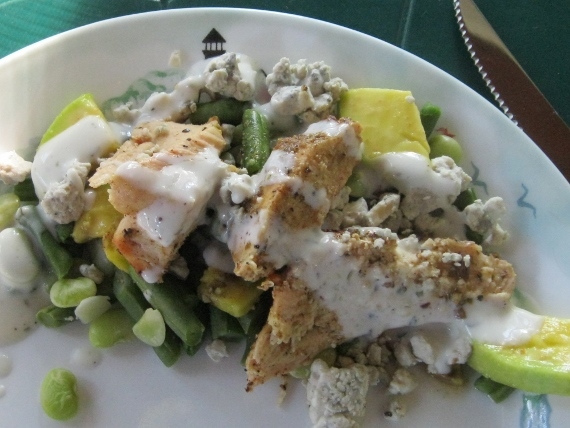 Serve chicken over beans with avocado, some added blue cheese and a drizzle of my low fat Ranch dressing. 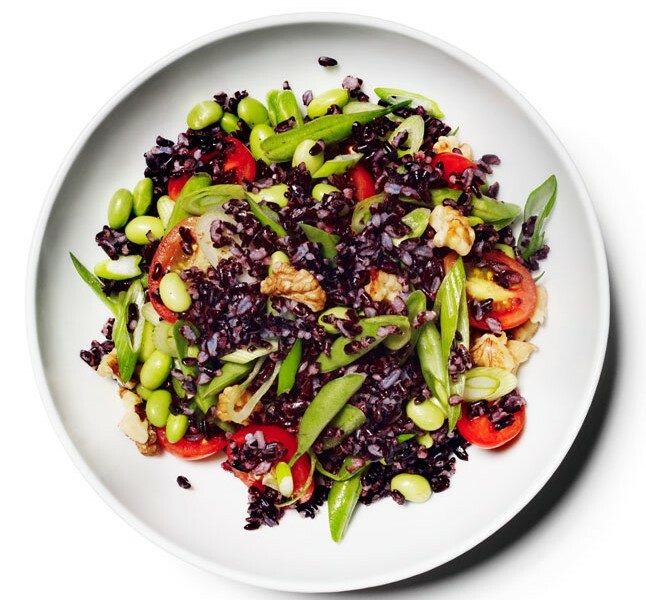 I THOUGHT EDAMAME WOULD ALSO BE GREAT IN THIS SALAD AND SOMETIMES I GRILL SOME COLORFUL VEGGIES WHILE GRILLING THE CHICKEN TO ADD SOME COLOR (SWEET PEPPERS OF VARIOUS COLORS OR EVEN SWEET POTATO FRIES). I COOK THE ROAST IN THE CROCK POT ALL DAY SO IT JUST FALLS APART AND THE POTATOES ARE QUICK AND EASY IN THE MICROWAVE INSTEAD OF BOILING. 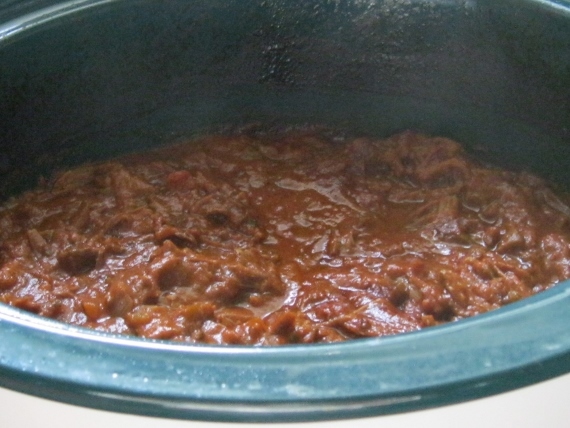 Mix 1st 4 ingredients in 5 qt slow cooker. Add beef to slow cooker and spoon sauce over top. Cover and cook on LOW 8-10 hours. Remove meat to cutting board. Stir peanut butter and cilantro into sauce. Slice meat against the grain and return to sauce. 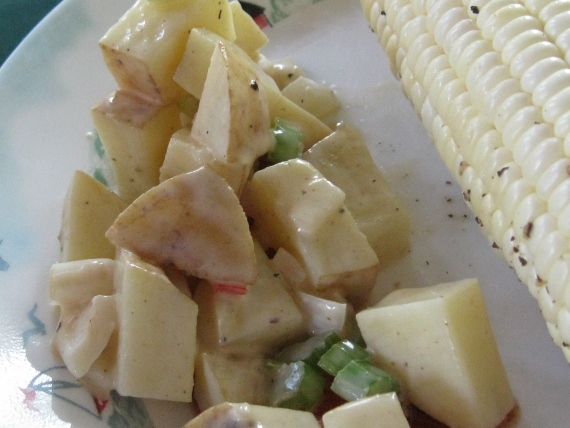 Cut red potatoes into chunks. Peel and cut garlic cloves into slices. Transfer both to a microwave safe bowl with about 1/4 cup water. Cover and cook on high 5-7 minutes until potatoes are tender. Mash potatoes and garlic with dressing (yogurt) and parmesan until light and fluffy. Sprinkle with parsley. I LIKE GREEN BEANS WITH THIS BUT I HAVE NOT HARVESTED ANY YET SO I USED A FROZEN STIR FRY MIX AND MICROWAVED UNTIL TENDER CRISP. ANY FRESH OR FROZEN VEGETABLE WILL DO. 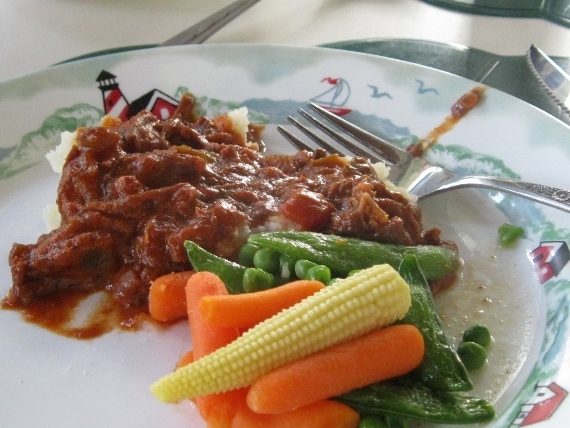 PLACE MASHED POTATOES AND VEGGIES ON SERVING PLATES AND SCOOP MEATY SAUCE OVER THE TOP AND ENJOY! A HEARTY AND SAVORY MEAL THAT IS EASY AND WON’T HEAT UP THE KITCHEN TOO MUCH ON A HOT, SUMMER DAY. THIS TUNA SALAD USES PLAIN, NONFAT YOGURT IN PLACE OF HALF THE MAYONNAISE TO CUT DOWN ON FAT. I SERVED THIS WITH TOMATO SLICES AND WHOLE GRAIN CRACKERS BUT IT IS ALSO GOOD WITH LETTUCE AND TOMATO IN A WHOLE WHEAT PITA. This whole jar (about 16 oz) of Ranch Dressing is only 1.75 grams of fat and 255 calories! Whisk together, chill 1 hour before use. Perfect consistency and tastes better than bottled! 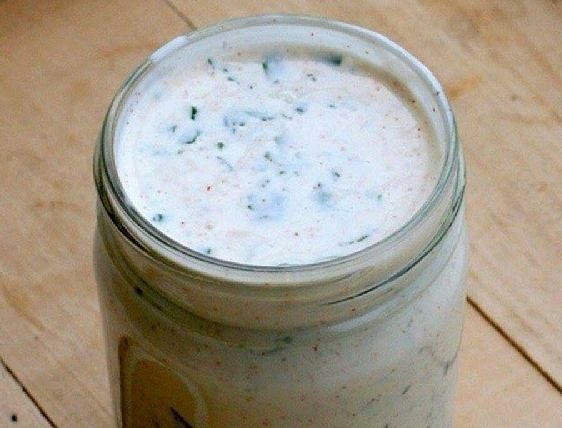 2 TBSP OF MY FAVORITE BOTTLED BUTTERMILK RANCH DRESSING HAS 11 GRAMS OF FAT AND 110 CALORIES! 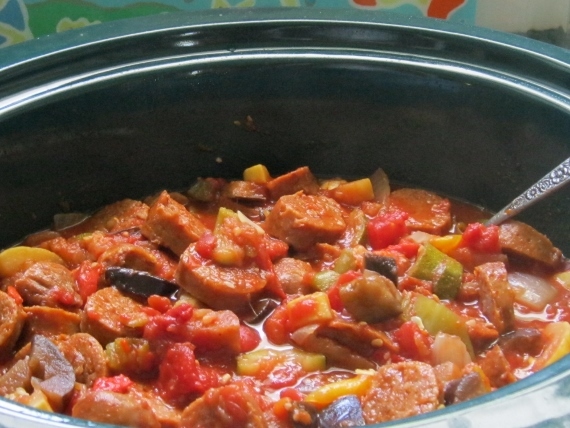 I MAKE MY RATATOUILLE IN THE CROCK POT TO CUT DOWN ON HEATING UP THE COTTAGE IN THE SUMMER. Cut up all the veggies and place in Crock Pot. Place sausage on top and pour diced tomatoes over everything. Cook on LOW 6-8 hours (I like cooking less for crisper veggies). In the last hour of cooking remove sausage links and cut up*. Add tomato paste, sugar and spices – mix well and then return sausage to the Pot. *If you use sausage patties you can just break them up and you won’t need to cut anything up later but my sausage links were frozen so I cooked them and then cut them up. YOU CAN MAKE THIS MEAL VEGETARIAN BY ELIMINATING THE SAUSAGE. I LOVE TO SERVE IT OVER NOODLES (I USED WHOLE WHEAT THIN SPAGHETTI) BUT IF YOU WANT A GLUTEN FREE VERSION TRY OVER QUINOA OR EVEN SPAGHETTI SQUASH. I ADDED SHREDDED ITALIAN STYLE CHEESE, PARMESAN CHEESE AND A FEW FRESH BASIL AND PARSLEY LEAVES AS A GARNISH. OF COURSE, I SERVED THIS MEAL WITH A BIG SALAD (WITH LETTUCE AND SPINACH FRESH OUT OF THE GARDEN TOO – CAN’T WAIT FOR THE REST OF THE VEGGIES TO RIPEN)! THIS MEAL IS SO GOOD YOU COULD GET “THANKSGIVING FULL” ON IT! I ADVISE HAVING THE SALAD FIRST SO YOU DON’T OVERDO ON THE RATATOUILLE! Combine seasoning ingredients in a small container. Trim fat from beef and press seasoning mixture evenly into surface of steaks reserving about 1 Tbsp of the seasoning mix for the salsa. Grill steaks to your liking (about 10 minutes each side). Meanwhile, in a medium mixing bowl, combine salsa ingredients and add reserved seasoning mixture. Mix well. **I USUALLY MAKE THIS MEAL IN THE MORNING AND PLACE THE STEAK IN A ZIP-LOCK BAG WITH THE SEASONING FOR LATER GRILLING. REFRIGERATE THE SALSA AND THE FLAVORS MINGLE ALL DAY. Mix first 3 ingredients in a small bowl. In a large bowl combine the remaining ingredients. Add dressing and mix well. REFRIGERATE UNTIL DINNERTIME. *RED POTATOES WOULD ADD MORE COLOR; SWEET POTATOES WOULD ADD COLOR AND VITAMINS; SOMETIMES I ADD OSCAR MEYER REAL BACON CRUMBS TOO BUT THAT WILL INCREASE CALORIES AND FAT! SHUCK YOUR CORN, SLATHER A LIGHT COAT OF BUTTER OVER THE KERNELS AND LIGHTLY SALT AND PEPPER. WRAP IN FOIL AND GRILL WITH THE STEAK FOR THE LAST 10 MINUTES. SOME PEOPLE PREFER TO SOAK THEIR CORN IN THE HUSK AND GRILL WITH THE HUSK ON – I JUST FIND IT HARDER TO SHUCK WHEN IT IS HOT SO I USE THE FOIL WRAP. 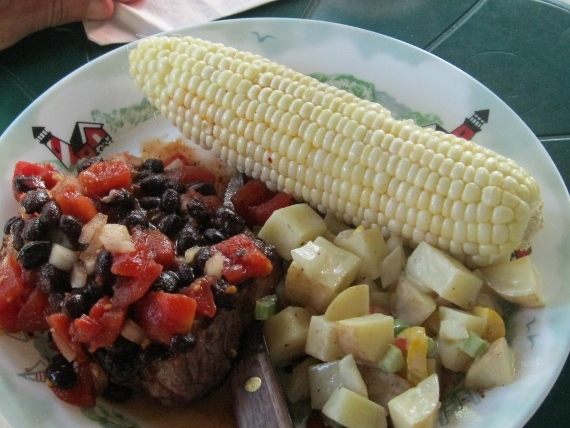 POUR THE SALSA OVER YOUR GRILLED STEAK AND HAVE A BIG FRESH SALAD TO ROUND OUT THE MEAL. 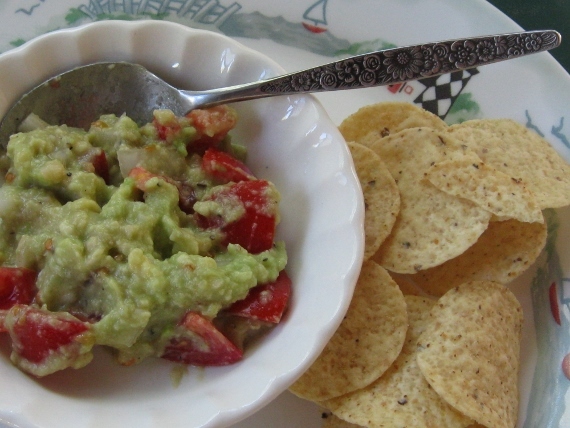 THE SALSA IS ALSO EXCELLENT ON IT’S OWN AS AN APPETIZER SERVED WITH TORTILLA CHIPS. Place in the oven for 30-40 mins. 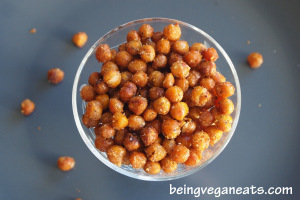 stirring around the Chickpeas every so often to ensure proper browning. GREAT HIGH PROTEIN, LOW FAT SNACK!! Cut the avocado in half, remove the seed and skin and roughly chop. Place in a medium mixing bowl. Mash with a fork. Add the rest of the ingredients and mix well. Refrigerate at least an hour to let the flavors mingle! Serve with tortilla chips or for an even lower fat option, whole wheat pita triangles! 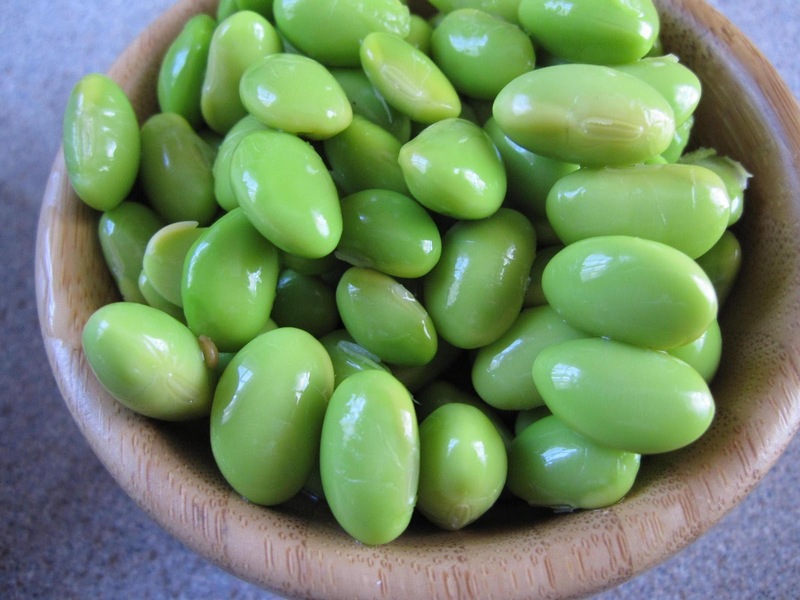 Edamame is just soybeans in their unripe form, still green and sweet in their pods. Mature soybeans are dry and brown, and good for making tofu and soymilk. But the green beans are good to eat steamed or stir-fried. 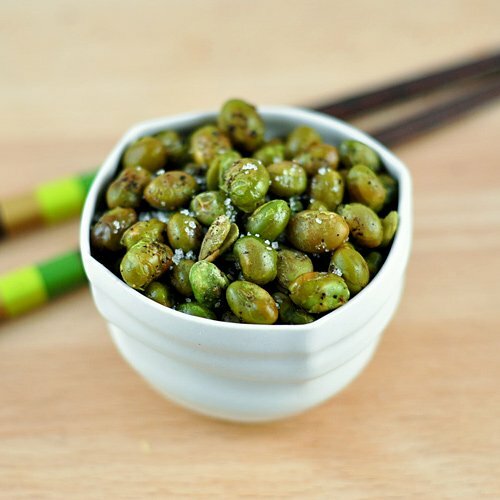 Straight up, with salt – buy bags of frozen, steamed edamame in their pods and just warm it up. Peel and eat! Stir-fried – You can do many things with those tender little green beans, once they’ve been slit out of their pods, and stir-frying is another great option. Throw into some leftover rice with an egg and quickly stir-fry until hot. 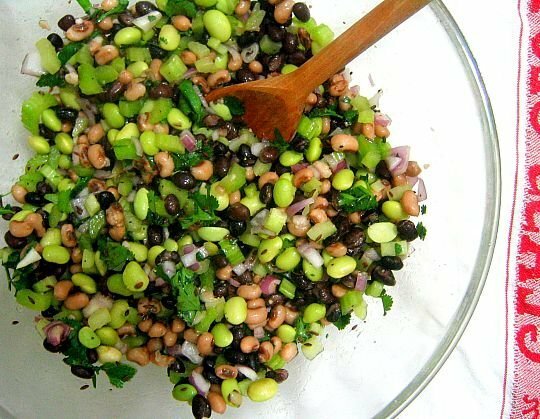 In a bean salad – Edamame is also great in tossed bean salads, like this Three Bean Salad with cumin, garlic, lime juice, and black-eyed peas. 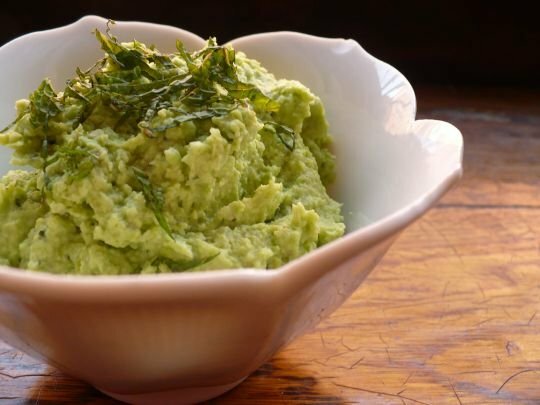 Pureed in a dip – Here’s a great way to make a party dip that’s healthy but still full of lively and bright flavors: puree edamame beans with lemon, mint, and cheese into a great snack dip. 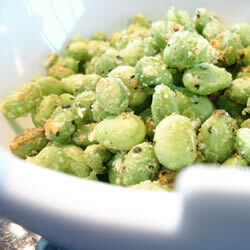 Roasted with sea salt and fresh ground black pepper – Roasted Edamame. The easy, breezy and oh so hot days of Summer are upon us. So what better treat to make then one that you can whip up and stick in the freezer. 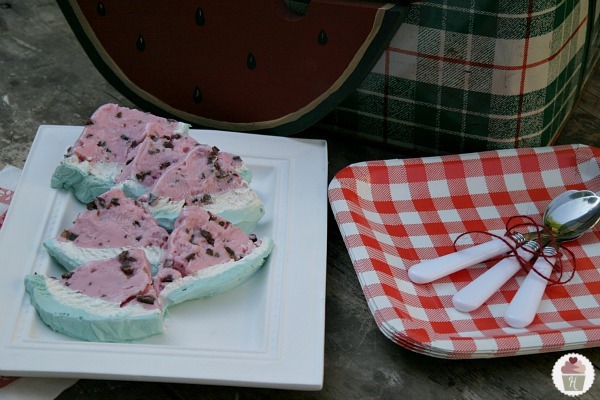 These cool and creamy Frozen Watermelon Slices are perfect for those hot Summer days, a fun weeknight dessert, or even for your Fourth of July Celebration. With only a few ingredients, the Frozen Watermelon Slices are a cinch to make, they did take some time because each layer is frozen, but they were super easy. Line a 1 1/2 quart glass bowl with plastic wrap. Divide an 8 ounce tub of COOL WHIP in half and add a few drops of green food coloring. Mix well and then line the bottom and sides of the bowl. Freeze for at least 30 minutes. Add the remaining COOL WHIP, spreading evenly on the bottom and sides . Freeze for at least 1 hour. Soften Strawberry or Raspberry Sorbet. Fold chocolate chips into softened sorbet and spoon on top of COOL WHIP layer. Freeze for at least 4 hours. To serve, invert bowl onto a cutting board, remove bowl and plastic wrap. Run a large sharp knife under hot water and cut in half, and then into pieces. Serve immediately, store leftovers in freezer. HAVE A HAPPY FOURTH OF JULY! !